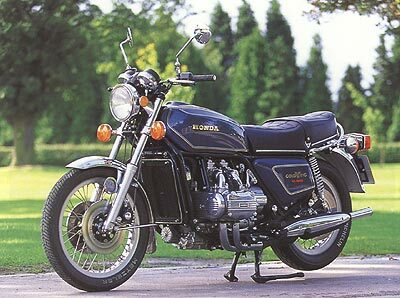 The first Goldwing was unveiled at the cologne show in October 1974, Honda decided to abandon the flat-six engine, and pursue the grand tourer with the more compact flat four engine of 999 cc capacity. It was water-cooled, had belt-driven single overhead camshafts, four 32 mm constant-vacuum carburetors, a five speed gearbox, and a shaft drive to the rear wheel and had a weight of 226 lbs. The rear fork was integrated with the shaft drive, which carried a universal joint at his front end and a bevel box at the rear. Up front were telescopic forks with hydraulic damping. Spoke wheels were fitted, with a 3.50x19 inch tire on the front and an unusual 4.50x17 inch size tire on the rear wheel. The GL 1000 featured engine dimensions of 72mm x 61,4mm compression ratio was 9:2:1 Power output was 80 bhp. Wheelbase was 60.5 inches for optimum straight-line stability and his weight was 635 lbs filled up with all the fluids. The Tank was a dummy, filled with electronics, and air filter, the real tank was under the buddy seat. It could hold 19 liters or 5 (US) gallon. The original GL1000 Gold Wing, powered by a 999cc liquid-cooled horizontally opposed four-cylinder engine, revolutionized motorcycle touring. The faux fuel tank contains electrical components and storage space. Spoked aluminum rims are standard. Note the black exhaust system, with chrome heat shields and tailpipes. A new model marks the Gold Wing's second year. The GL1000 LTD joins the unchanged standard model, and features gold striping, special LTD sidecover badges, chromed radiator shroud and screen, quilt-pattern contoured seat, gold wheels and spokes, gold-stamped GL1000 owner's manual, and leather key case. The LTD's front fender is slightly flared. Honda begins to incorporate small but important refinements based on customer requests, as the Gold Wing's continues to grow in popularity and redefine touring. Chrome heat shields on the header pipes are now standard, as is a higher, recontoured handlebar, redesigned neoprene grips, a new dual-contoured seat, and a fuel gauge. A new instrument panel in the center pod with fuel, voltage and coolant temperature gauges helps distinguish the GL in its fourth year. Honda also fitted 1mm-smaller carbs and FVQ shocks with two-stage damping, redesigned and chromed the exhaust system, mounted the rear turn signals on the fender, and bolted up maintenance-free ComStar wheels. The GL1000 reaches the peak of its development in 1979, and will be the last Gold Wing to be powered by a 999cc engine. Changes this year are few and minor: Rectangular turn signals replace the previous round ones, control levers go from silver to black, and a twin-bulb taillight with CBX-type ribbed lens replaces the single-bulb unit.